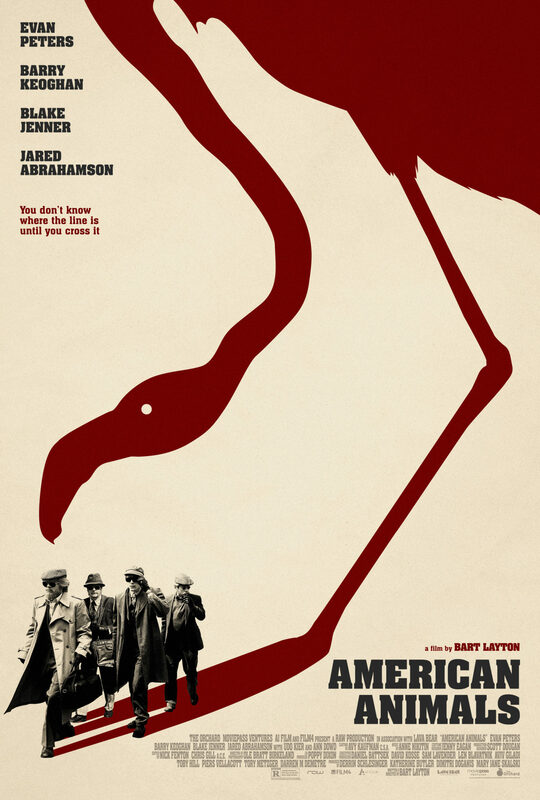 American Animals is yet another true crime story that tiptoes into tones of humor and desperation, never finding all the right steps to make that tricky dance. As evident from the trailer’s boasting of the true story, it’s a heist so wildly amateur that the movie seems to be banking on the oddness. This is most evident in the approach of interviewing the real men behind the robbery of a college library who give commentary both comical and regretful. It’s all such a messy juggling act of an attention-grabbing sideshow that can’t quite decide on what this movie is about. There are early suggestions that the thieving of a $12 million art book was out of a nihilism of youth. 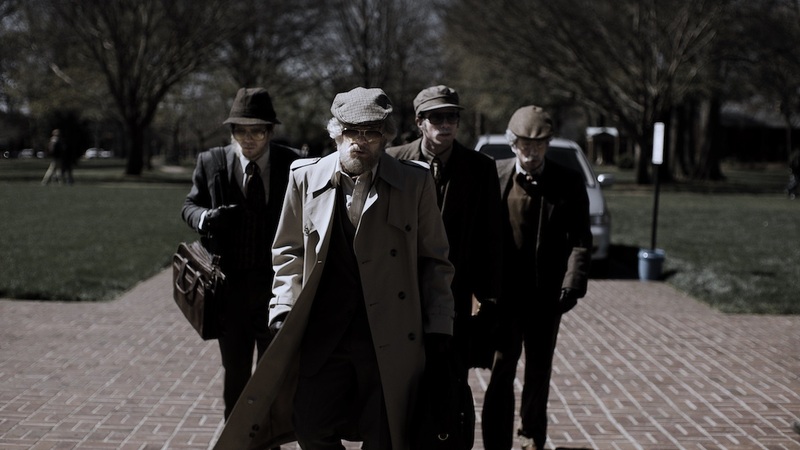 The student criminals Warren Lipka, Spencer Reinhard, Chas Allen, and Eric Borsuk seem to be coming from a place where they feel robbed of happiness in their lives at Transylvania University. They have rocky home lives, are disillusioned with their educational ambitions, and look on lethargically as the highlight of their evening is watching punk kids set a grocery cart on fire in a parking lot. Their logic is that the university’s library can do without that rare and expensive art book of birds, seeing as how it’s only guarded by one kindly librarian. They figure it’ll be an easy score and apparently haven’t seen the plethora of true crime movies that almost always end in disaster. Or maybe they knew exactly what they were doing and had their hearts set on being in a movie based on their stunt. It’s surreal to watch what leverage the director gives these subjects when they describe how their scheme went down. They have a troubled relationship and do not appear in the same room together for their interviews, but present conflicting accounts with a cutesy tone as if it’s an adorable Rashomon. But how sweet can these boys be when they’re dumb enough to dream the robbery will go down with Ocean’s Eleven grace, ignorant enough to stumble through black-market dealers, and heartless enough to subdue an old librarian that is forced to the ground in tears? The young actors certainly try their best to slip into the roles, even if the movie gives them characters with signals as mixed as the recollections of the true criminals. Evan Peters plays Warren, who is infatuated with the natural artistry of the prize, but doesn’t seem much interested in the art past giving a theme for the film’s title and poster. Barry Keoghan plays Spencer, the more ruthless of the bunch, willing to go through with the plan coldly while everyone else has frost on their feet. Blake Jenner and Jared Abrahamson fill those freezing shoes with much bickering and blubbering when their plans go awry. There’s uncomfortable distance with this material where writer and director Bart Layton refuses to favor a perspective, merely staging the events with uneven vibes and letting the drama and laughs fall where they may (if at all). The boys’ first plan to rob the establishment by dressing themselves up in the most unconvincing of old men makeup is a manner both tense and ridiculous. Perhaps there was a twinge of a smirk somewhere, but there’s very little empathy when their second visit results in beating old ladies and smashing into cars. The heist at the Transylvania University Library is certainly a crazy story, but perhaps not crazy enough to warrant a film that does little more than wink and shrug at its true-crime tale. So fast and loose is the film’s focus on the messiness of robbery and the humor in stumbling through the operation. What can be drawn from such an experience? From a distance, it could be quirky crime. On closer examination, it’s an endorsement for getting your own movie, the way these criminals picked up their lives and appeared in a film after serving time. It’s such a wicked perspective on the answer to the boredom of suburban living that it makes the exaggerated dream of pulling swanky heist a little less silly.